I would love to say that I am a bold, confident woman, but the truth is I’m just a work in progress. Probably a little bit like you if you’re honest. I want to be complete. Whole. No blemishes or scars. Dare I even hope, acceptable and perfect? 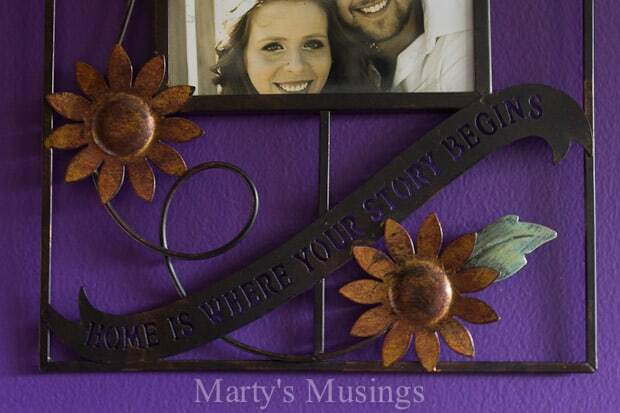 Funny how my decorating seems to mirror my life. Incomplete. Unfinished. Blemishes and age spots. Good intentions and best laid plans and all that. Yet those characteristics that make me unique, chosen and beautiful in God’s eyes are the very ones that I so often try to change. So today instead of perfect, I give you my newest favorite room, a new improved work in progress! 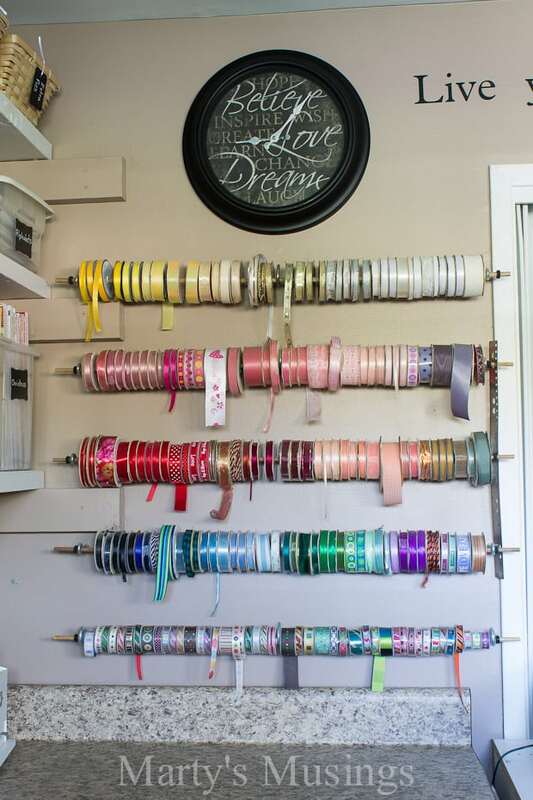 I decided I wanted my craft room to make a statement that reflected my life. With overflowing boldness and courage. If this accent wall doesn’t say bold I don’t know what does! 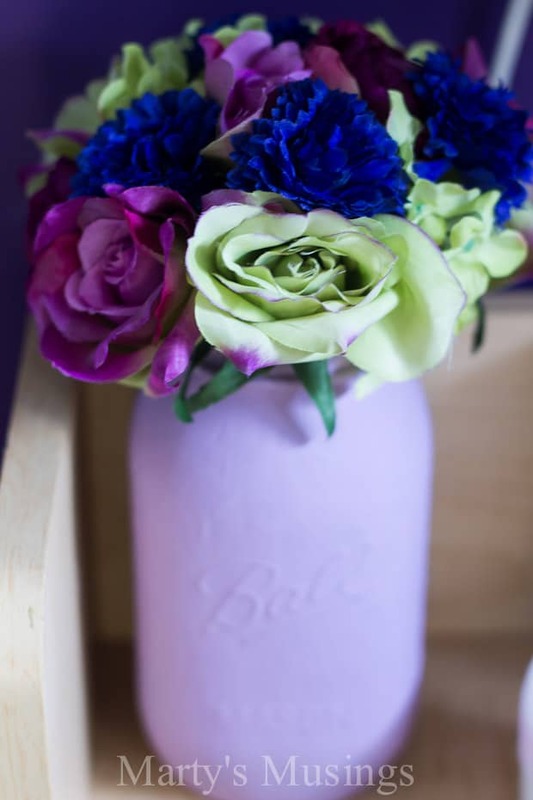 I can honestly say I’ve never, and I mean never, used purple in my home before. When Behr asked me to try their new Marquee line of paint I viewed the paint chips studiously and went straight to purple. Not lilac or Lavender Wash. Not Expressionism or Splendor and Pride. Go big or go home was all I could think when my DIY hubby got through putting a coat on the wall. I choked back my fears that I had completely ruined this room and gave myself permission to live with it for a while. Love it or hate it, this is the room where I allow myself the freedom to create. Experiment. Take a risk. Perpetual Purple, you have taught me how to risk failing. And a whole lot of chalkboard tags (made with this amazing paper)! 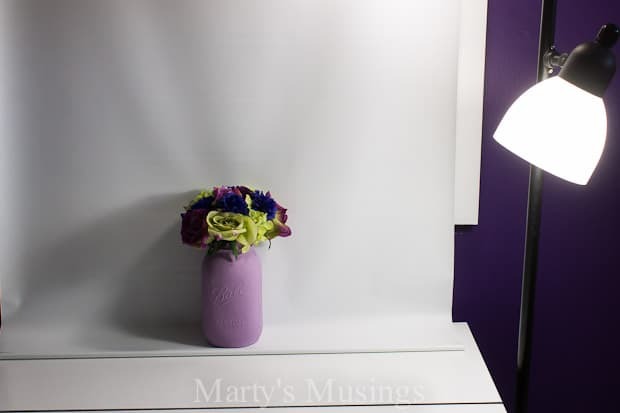 One of my main goals for the space was to have an area to use for photography. When this clever shade is not in use the old window functions as creative inspiration for me. or be kept closed as a space saver. I took the doors off the closet, fitted two organizers side by side and added just a few more chalkboard labels and dollar plastic baskets! You can find a tutorial for the quote below here. 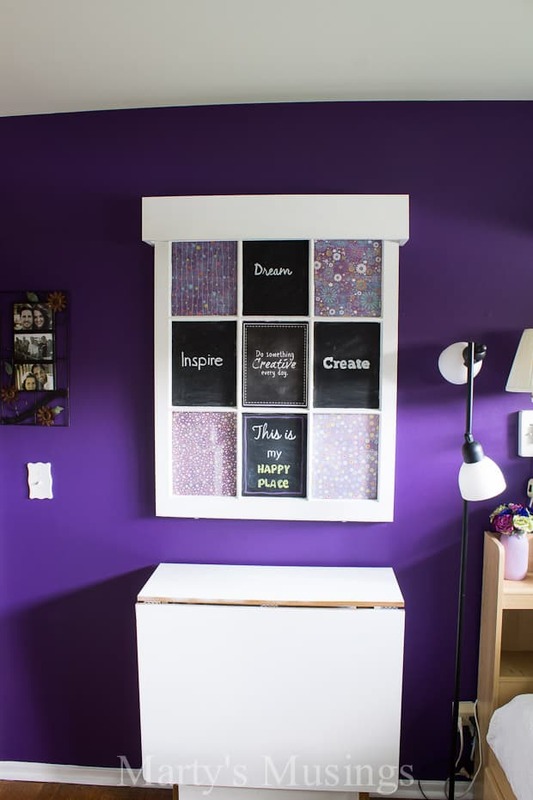 I covered this old bulletin board with fabric from my oldest daughter’s wedding and lace from my ribbon collection. 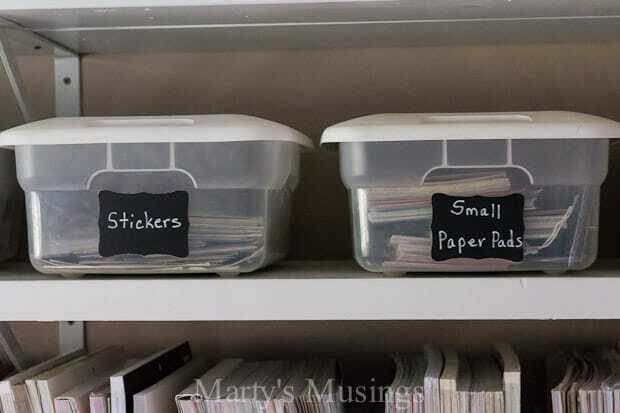 Favorite cards and scrapbooking layouts line the wall to remind me what is most important. Curious as to what the room looked like before? If you go here you can see what I had to work with! I have so many details to share with how I pulled this room all together while spending hardly any money. You won’t miss a word if you subscribe via email in the box below! 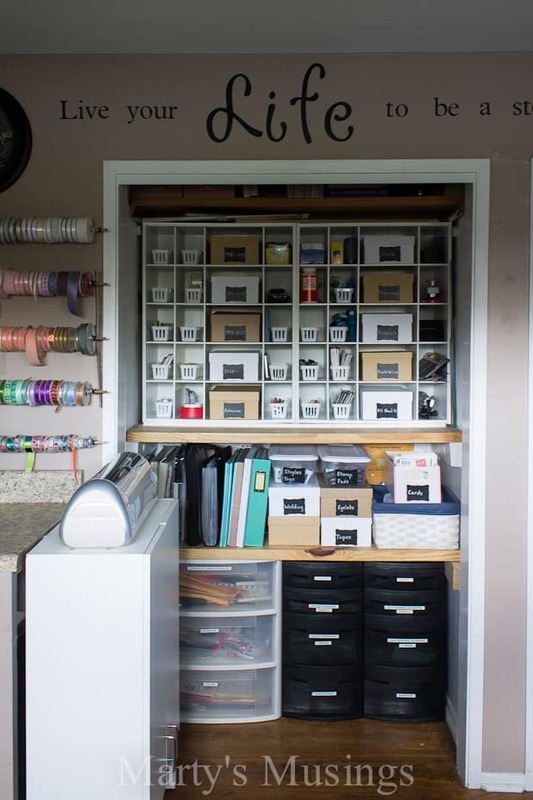 I was invited to join Angie from Country Chic Cottage for a tour of some amazing craft rooms and spaces. 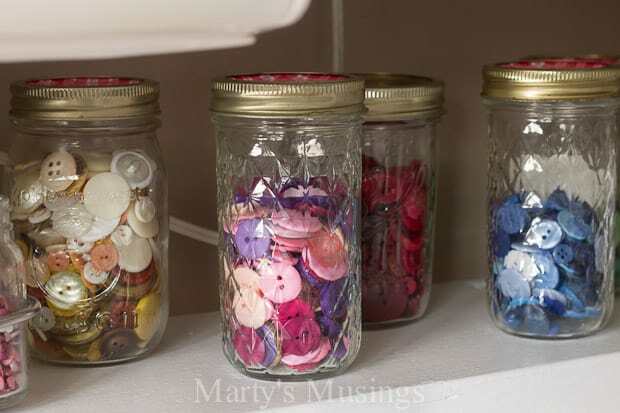 Check out this link for a list of all the craft room tours. 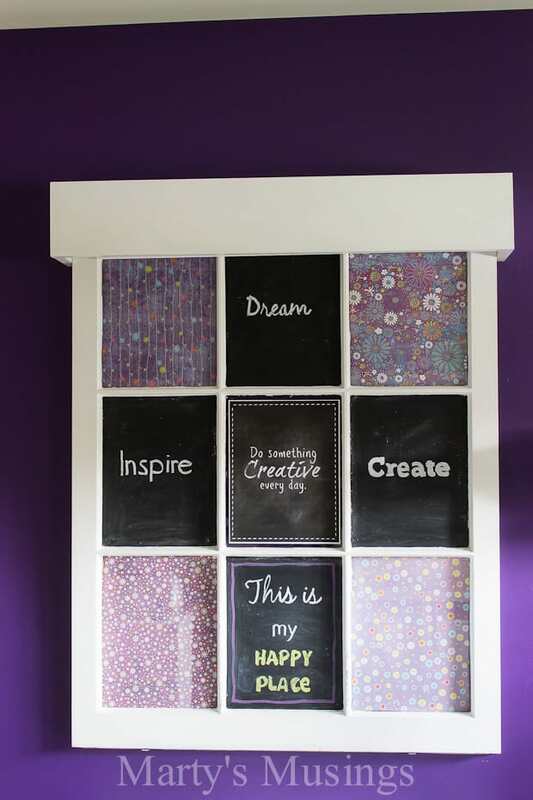 You will be amazed at the creative ideas and beautiful spaces this group is sharing. Thanks for the feature, Julie! With the purple it was go bold or go home and I love it! Hi, Jeannie. The units were from Target many, many years ago and I don’t know if they still have any. They were around $20 back then and are very sturdy! 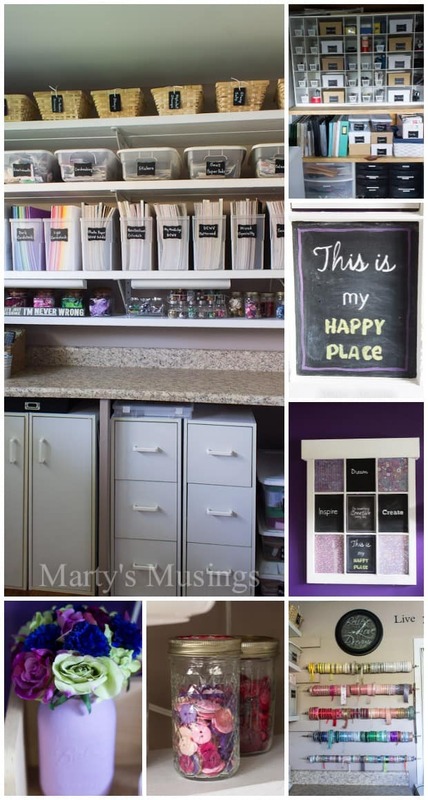 Found your site via the link party at Tabler Party of Two and wanted to take a moment to let you know I enjoyed browsing around your blog and will be pinning this post as I am always looking for ways to organize my craft supplies. 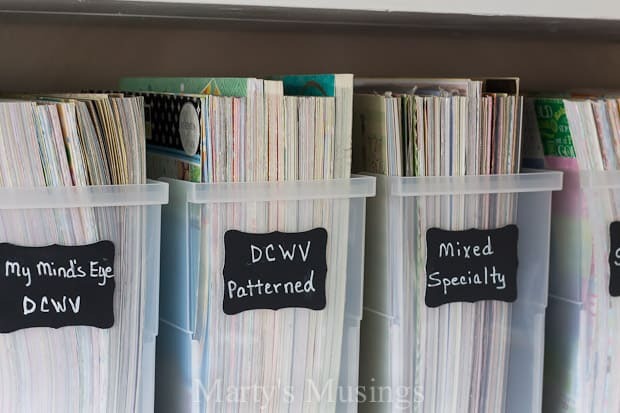 I am dreaming of the day when I have a room devoted to blogging and crafting, but until then I am gathering inspiration, and your post will become part of that stack of ideas.Thanks for sharing! 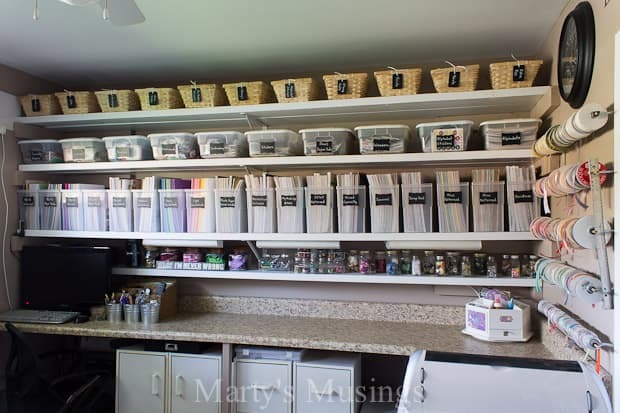 This craft room is super impressive! I definitely need to organize mine…I just have boxes with random stuff in it 😀 Loving that accent wall too! Would love to one day stay in one place enough where we can paint fun colors on our walls. 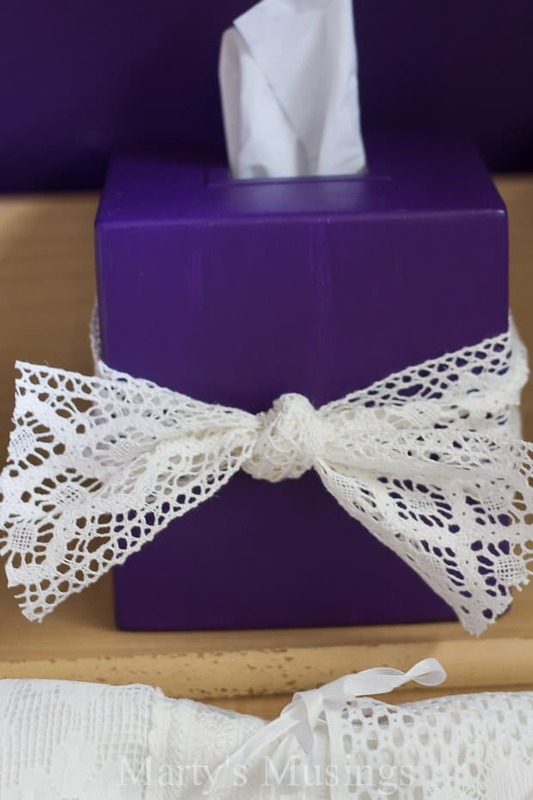 Visiting via the Something to Talk About Link Party! Thanks for sharing! I love how you have organized everything. Organization is one of my most favorite things to do. I really need to get my scrapbook paper organized. Thank you for sharing at The Creative Corner this week. Have a great weekend! organization always makes me happy. 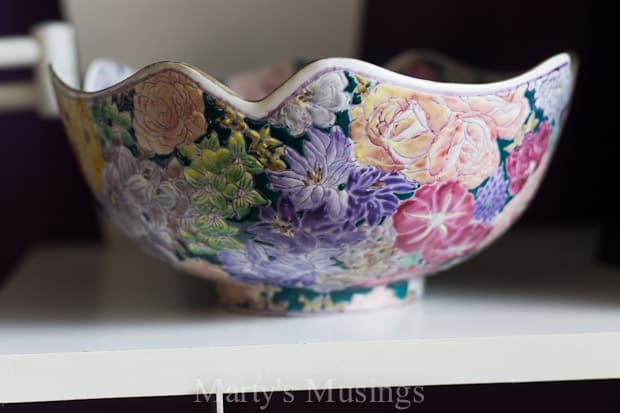 Thank you for sharing at the Thursday Favorite Things blog hop. Watch for your feature tomorrow. xo P.S. 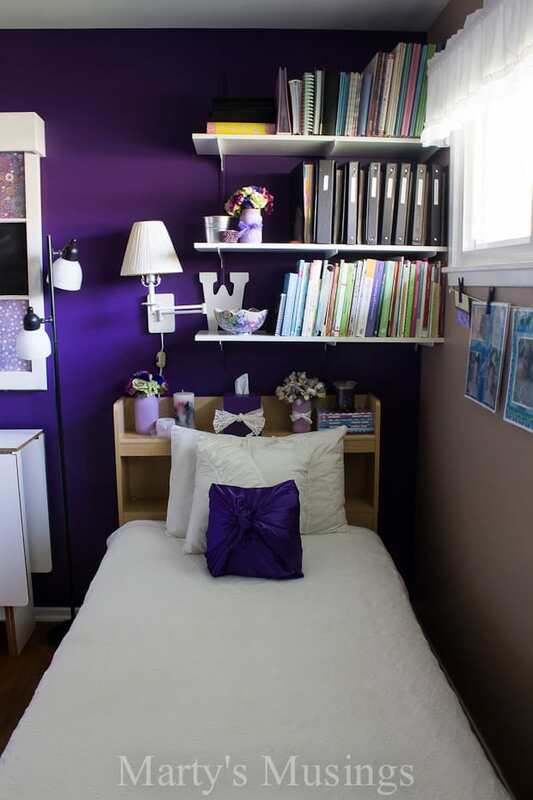 I have a purple art room! Hi, Sue. These files do hold the 12×12 paper and you can find them on Amazon through this link: http://www.amazon.com/gp/product/B002OFCA9S/ref=as_li_qf_sp_asin_il_tl?ie=UTF8&camp=1789&creative=9325&creativeASIN=B002OFCA9S&linkCode=as2&tag=marsmus035-20&linkId=NV4GTJ37SOLA3EUP I have absolutely loved them! I felt a true kinship with you as I read your words about trying to create the perfect space & removing yourself. I have struggled for over a year to pull my room together because what I like & what it seems everyone else is doing are so completely different. BOLD HERE I COME! Hi, Patty. I’m so excited for you! 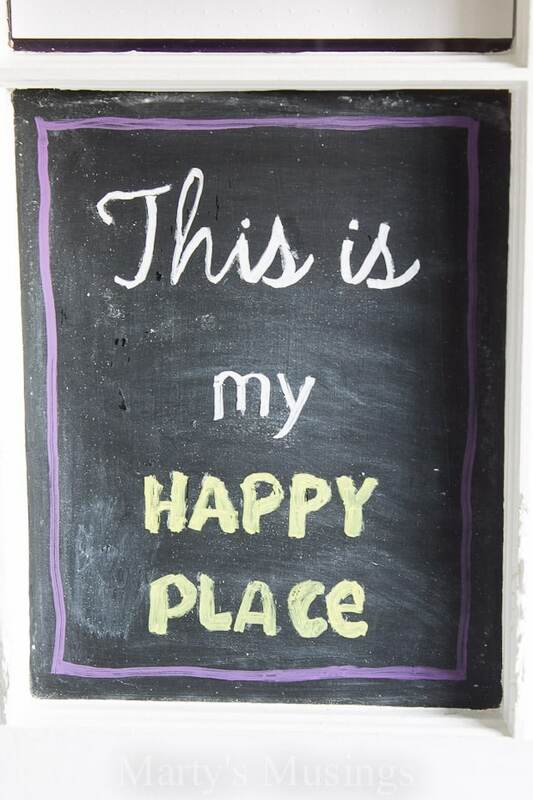 Your creative space should please you and be the one place that inspires you to create and be happy! It doesn’t even have to be put together or organized but just something you love. What color are you going to use?